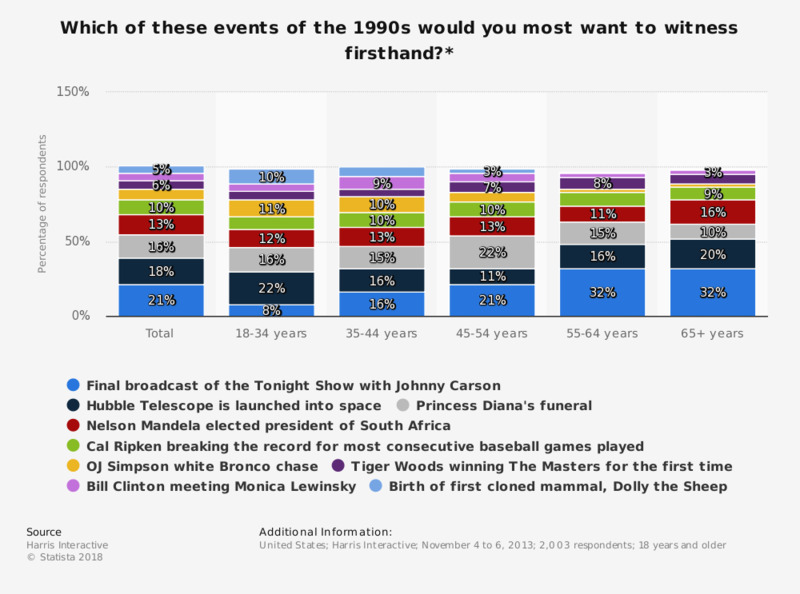 The statistic presents the result of the survey concerned with events from the 1990s people would most want to experience firsthand if they could. 18 percent of all respondents said that they would most want to see the Hubble Telescope being launched into space. On media did you follow what happened during the political week in Almedalen? In what way did you follow what happened during the political week in Almedalen? How often did you take part in one of the following political activities in the last year? How positive or negative is your attitude towards the politicial week in Almedalen? To what extent did you follow what happened during the political week in Almedalen? How important do you think that the political week in Almedalen is guarded by the media? Over the past year, how often have you come across political news content? Which of the following worldwide events mostly stroke your attention in the past ten months? Which party leader do you feel was the most talked about in the media in the political week in Almedalen?